We’ve all been there. You’ve nabbed the last seat on the bus, and you sink into it gratefully – resting your aching, tired ‘sure-I’ve-been-sat-at-a-desk-for-nine-hours-but-that-doesn’t-mean-I-haven’t-been-exercising-my-brain’ muscles. Two minutes later, you spot her. A lovely, glowy pregnant woman, complete with ‘baby on board badge’ pinned to her collar. And, even though you know she’s more tired than you; you know she’s growing a literal human inside of her stomach*; and you know that one day soon, said human is going to climb its way out of her body in a scene reminiscient of Alien, your heart still sinks. Because sometimes, you just really, really want to sit down. Thankfully, now you can, after London-based creative agency Olivia and Irene developed this range of alternative BOB badges. There’s ‘I really need the loo’, for those occasions when you have to cross your legs so tightly, there’s no physical way you could stand upright without falling over. There’s ‘I’m so hungover, please have mercy’, for times when you definitely have morning sickness – and whether or not it’s self-inflicted is entirely negligible. 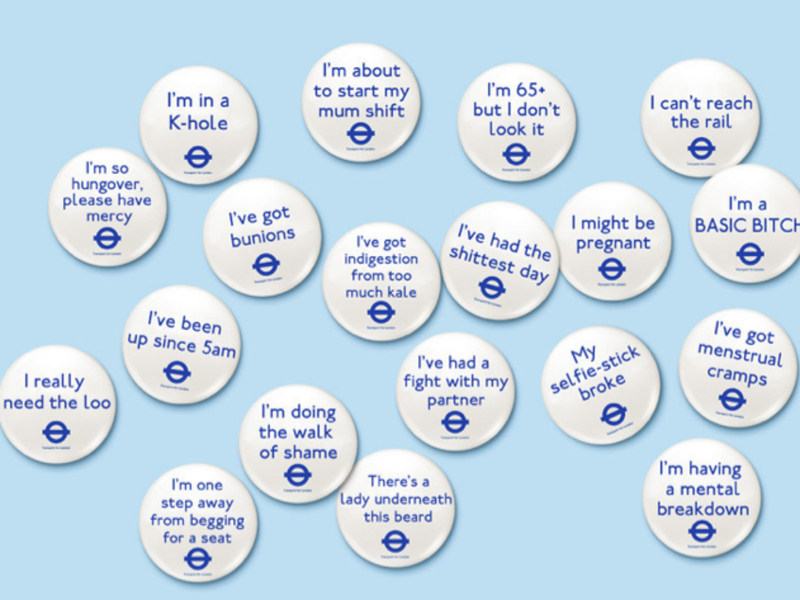 There’s ‘I’ve got menstrual cramps’, which honestly needs absolutely no explanation whatsoever, and should totally be a TFL-approved badge anyway. There’s ‘I’ve had a fight with my partner’, to justify the journeys when you don’t actually want a spare seat all – you just want to curl up on a stranger’s lap, sob into their shirt jacket and wipe your nose with their tie. There’s ‘There’s a lady underneath this beard’, for the days when your Polycystic Ovary Syndrome is playing up, and hell, if that doesn’t warrant an opportunity to curl up and read the latest E.L James novel then what does? There’s even ‘I might be pregnant’, for women who have just read this story about detox tea stopping your pill from working, and who are only on the bus in the first place because they have to home and pee on a stick, stat. Unfortunately, they’ve yet to design a ‘my tights are falling down and there’s no physical way for me to hoist them up here without you seeing my knickers’ badge. But we assume that’ll be part of their next collection.